The first time I’ve ever heard of Woodhill mountain bike park in the east of Auckland, was from Chris. He went there with a friend and immediately bought a season pass. I was so keen to find out what it was all about so I got really excited when we decided to shred the trails on the past Labour Day long weekend. 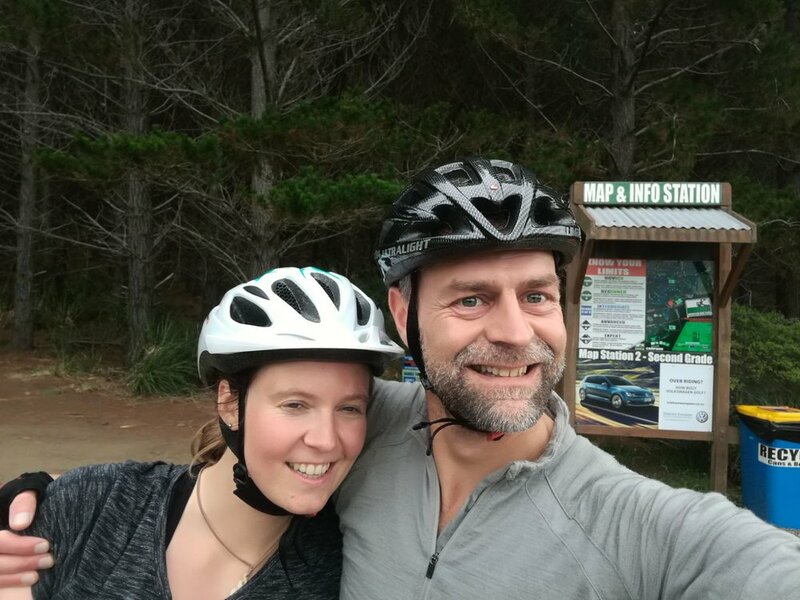 I’m a newbie on single trails and Woodhill forest was going to be my third ever experience on proper mountain biking. The place that popped the cherry of my “biking career” was THE place for downhill, in Whistler, Canada. It’s not that easy to find something equally enjoyable when you start off in mountain bike heaven. I only tried it one more time after that, in Switzerland. That was fun too, but a bit tough on my backside since I rode with my own hardtail bike. I still don’t have a full suspension bike and was a little worried on how to survive some hours in the hard saddle. But Chris assured me it would be fine and after a little more whinging I believed him. So we got the bikes ready, paid a visit to the loo one last time (important for us girls: there are no toilets apart from the one at the base! ), helmet on and off we went! Now, for those who know Whistler and some other mountain biking places with chair lifts and shuttle busses: Woodhill parks isn’t for the lazy ones. There are over 100km of trails for all ages and abilities, and all of them have to be climbed with the power of your own legs! As we made our way up to the first trails, my legs and lung already started to burn and I wondered how to survive the rest of it. At the top of the first climb is a sign with all the trails and we followed to arrow for “Auckland Eye” as apparently it’s a good one for beginners and intermediates. “Auckand Eye” is a really cool trail to ride as a beginner. I went reeeeeally slow and Chris often had to wait for me (but so did I when we went skiing, so we’re even again :-D) but no matter if you’re slow or fast, it’s very enjoyable. There were some more uphill bits but they make the downhill part so much more fun! And after we rode a little loop of the track for a second and third time I already knew what to expect around the next corner. This knowledge made me go a little faster each time and in the end, I just didn’t want to stop. But after about 3 hours my legs became heavy and we decided to stay safe and head back to the car. The mountain bike park is shared with a logging company which means that the scenery and even sometimes the trails change every now and then. We started off in a forest, rode in tree nursery for a while, then passed a logged area that made me feel like riding through a post-apocalyptic world. And back into forest. Back at the base we treated ourselves to coffee and one of the café’s yummy cookies before storing the bikes in the car. On the way back to Auckland we spontaneously decided to pull a stop in Riverhead for some after-ride drinks. There are two very nice restaurants in Riverhead that are worth visiting. The Hallertau Brewery and Riverhead Tavern. This time we decided on the Brewery. The drinks did turn into dinner when I realized I desperately need to eat something, like NOW! We only had brekky and kind of forgot to eat while riding the awesome trails and my body decided to revenge itself for this by making me feel a bit woozy. I’m really glad we ordered food though, because the beer sausage and Sauerkraut in woodfired bread was just amazing. And sorry, I forgot to #foodporn it, I was way to hungry to remember but very happy and well fed afterwards. It was the perfect ending to a perfect day. And I think I might have found my non-snow / summer alternative to skiing. 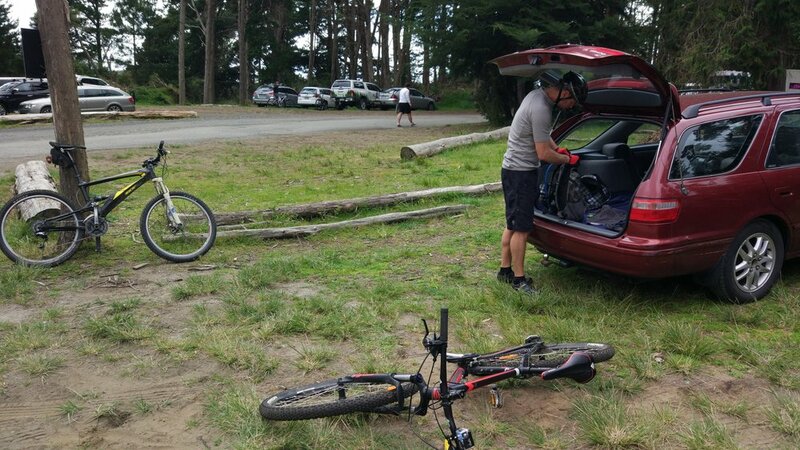 Woodhill is one of New Zealand's bikers’ paradise. There are over 100km of trails to shred for all ages and abilities. You can bring your own bike if you have one or just rock up and get one of their rentals. The rental prices depend if you want to take a hardtail (from NZD 35 for the first hour, then $15 per hour thereafter) or full suspension (NZD 95 for 4 hours). Helmet and the entry fee is even already included in the price! When bringing your own bike, the entry is a budget-friendly NZD 10 for the full day, with reduction for kids and youth. Woodhill is easy to reach. Take the North-Western Motorway and take the exit for Helensville. Just follow the Helensville signs and after the town of Waimaku there will be an intersection with a sign for Woodhill. Note (to self): Bring proper food and enough water with you, you will need it!